New Splicer with rebuilt Butler splice head. Installed in Massachusetts. 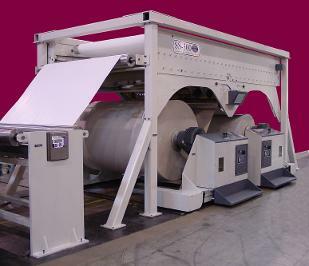 The new R & B model splicers are rugged, high reliability sheeter and corrugated splicers. 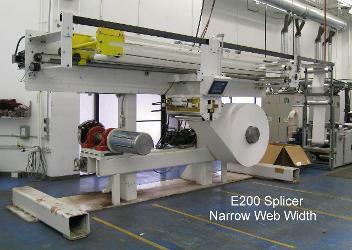 These zero speed splicers are designed using industry proven technology. 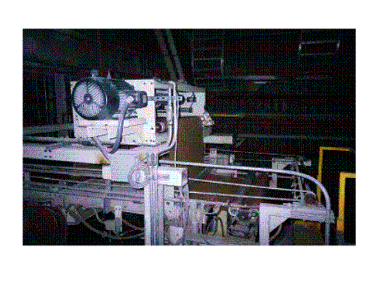 With normal routine maintenance, splicer reliability of 99% is easily attainable. The Constant Tension Unit will control output tension to a value adjustable by the operator. A pneumatic cylinder connected to a moveable roll is used to induce tension in the web. The pressure in the cylinder is proportional to the web tension. A nip point is created between a driven roll and a rubber coated nip roll. This nip point isolates the input tension from the output tension. A displacement sensor on the moveable roll creates a speed error signal. Any movement on this roll indicates a tension upset. If a tension upset is sensed the motor speed is adjusted to keep the moveable roll centered. This produces a constant tension on the output regardless of tension changes on the input side. Custom widths and tension ranges are available. The new R & B roll stands are rugged, high durability, hydraulically operated roll stands. 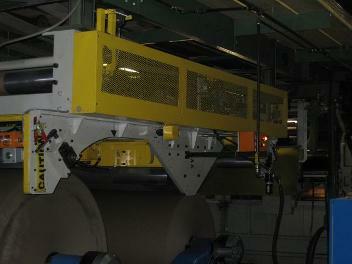 With normal routine maintenance these roll stands will be highly dependable. The R & B Web Alignment System consists of an array of detectors with a spacing of 0.1".